According to Freddie Mac, the Federal Home Loan Mortgage Corporation (FHLMC), multifamily rent growth should level out to its long-term average performance as interest rates increase. That does not mean that investing in a multifamily property is a bad idea, it just means that the supply and demand conditions are varying by location and adjusting to job growth or stagnation. Since most rental housing demand comes from 25- to 34-year-olds, theÃ‚Â FHLMCÃ‚Â expects the need for rental property to grow by up to 1.6 million as the employment picture improves. You do not have to be a high-level investor to participate in the expected rental housing increase. Younger investors, especially those in the under 40 range, might consider purchasing a property and renting out rooms, or buying a duplex, living in one side and renting out the other. While being a landlord has some hazards and pitfalls, having a constant income stream that helps to pay the mortgage, offers some tax advantages and also provides a place to live might be a great start to your real estate investment future. 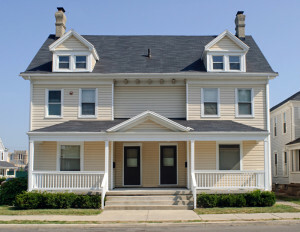 We can help you locate potential single-family homes with multiple bedrooms to let to students or others, or multi-family properties that might be an excellent investment for you. Location is important since many renters prefer to live nearer to where they work, shop, worship or attend school, while owners often are more willing to live further away in order to afford their mortgage. Buying a duplex, for example, might take a little more work than a single-family home, but the process is similar. In fact,Ã‚Â FHAÃ‚Â (the Federal Housing Administration) will loan up to 96.5% of a duplex’s value as long as the owner intends to occupy one of the units for at least a year. The Federal Housing Administration credits the buyer with as much as 75% of the rental income as part of their qualifying income and will finance as much as $347,000 for a two-unit property in some locations. The most obvious advantage of owning a duplex is help with the mortgage payment via the rental income. In addition, however, duplexes are more affordable than larger apartment complexes, and often cost the same as a single-family home. If you have an elderly parent or adult child, you can rent to them so that family members have privacy, but share in the cost of the family property. Disadvantages include close proximity to your tenant. If you have a needy tenant, you might find yourself continuously interrupted by a knock on the door. Your rental income is not a guarantee since there is no certainty that you will find a tenant, and when the unit is vacant, you are still responsible for your entire mortgage. Just as in your own home, you are responsible for all of the repairs, upgrades to appliances, maintenance and general upkeep of either a single-family rental unit or a duplex or multi-family unit. Since most states and countiesÃ¢â‚¬â€and some citiesÃ¢â‚¬â€have specific rules about cleaning, repainting and other costs between tenants, make sure you know the rules and regulations for your location. So, whether you are looking for a single-family home to rent or a duplex to live in while you rent the second unit, we can help you with the information you need to find the best property for your needs.